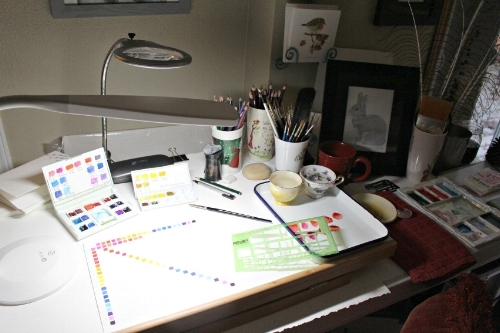 I wanted to get organized and spend some time getting to know my watercolor palette. I have chosen to have a minimal palette like that of my botanical illustration teacher, with a few of my favorite colors added. I love the box I chose for my paints, especially because it has a viewing window that I placed a piece of my original watercolor art in – and I store my paints in it still, however, I keep them within some old empty containers that I obtained through Winsor & Newton. The two containers are perfect for traveling and storing my yellows separate from my reds and blues so they don’t get so messy. These two containers fit perfectly in my paintbox. It's nothing fancy like the beautiful wooden watercolor boxes I have seen online, but I will save that for another day - once I get to know my palette better. I also use two different palettes to mix my colors. One is a white tin pan and the other is a white porcelain palette. They both work very well – I think the main thing for your palette is that it is white and it won’t stain. 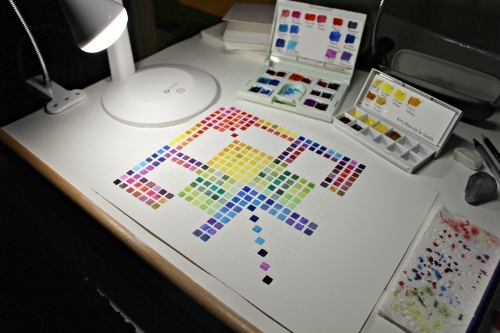 Today I want to show you how I decided to do a watercolor chart of the 20 colors in my palette. I have used this square ruler and a 9 x 12 inch piece of my favored Moulin du Roy, 140lb, Hot Pressed watercolor paper for my chart. I have created 20 squares across the top for each of my palette pigments and 20 squares down the left side for the same colors ( you may have more or less than this depending on your palette size. 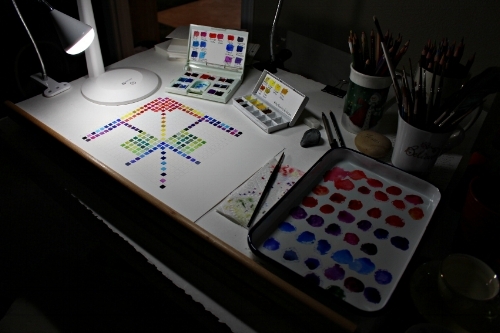 I initialed each square so I can tell which colors to use and I painted in each square with its appropriate color. To begin with, I use only Winsor & Newton Professional Watercolor 1/2 pan paints and as I mentioned above, I have a simple palette of only 20 colors. I purchase my colors through DickBlick.com. Some like to buy the tubes and squeeze their watercolor paints into 1/2 pans to dry and use them that way. Whichever you choose I'm sure will be fine. 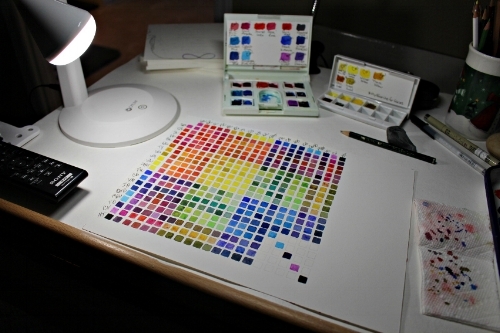 The following are the names of the 20 watercolors I have in my palette and have uses for this color chart. I did not do my colors on the chart as I have listed them above. You can decide in what order you would like to do yours. As you can see in the picture above and below, I took time to make the small squares and label each one with the initials of my paint colors. There are many different ways of laying out your color chart, but I wanted to show how two colors mix together using all 20 colors in my palette, and this layout will work just fine. 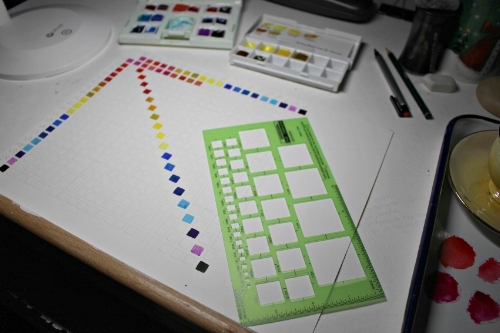 Making a color chart for your watercolors ends up being good practice because it helps you to not only get organized, but to become more familiar with your colors and how they mix with each other, how they react to the watercolor paper you have chosen to use, and the new colors they create when they are mixed together. Also, you can use the color chart to discover which color will work best when working on a particular botanical subject. As you paint each square using your favorite brush (I am using my #4 Winsor & Newton Series 7 Miniature, Sable) take it slow and train yourself to stay in the confines of each square. It sounds easy, but believe me it takes lots of practice to achieve this, so making this color chart will certainly help perfect this much needed technique in your botanical illustration work. In the right margin of my color chart I will add at least two columns of glazes that I like to use, namely Quinacridone Gold and Green Gold, as well as two columns of shades for each of my 20 colors – one using a bit of Neutral Tint and the other using a complementary color for shading. You can see how I progressed with my color chart down below. 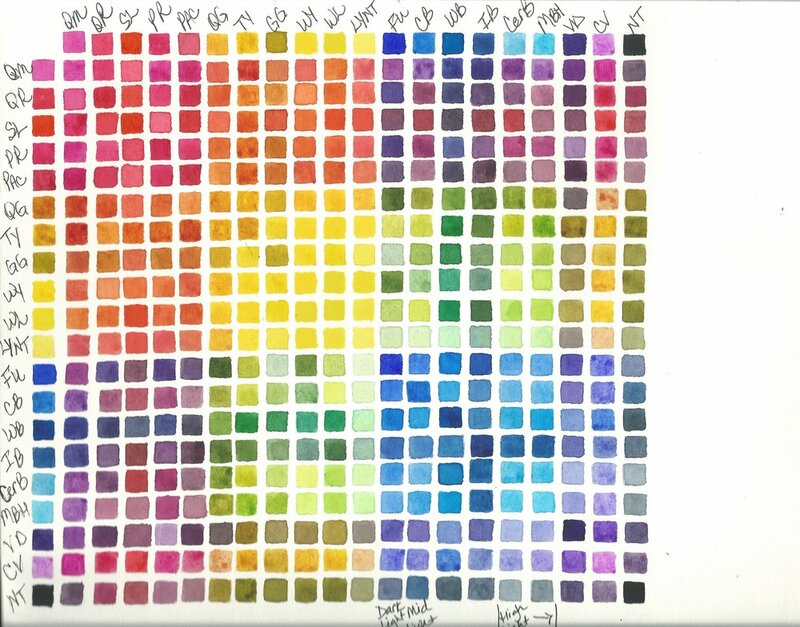 I love having this watercolor chart of my watercolor palette. It has helped me several time to figure out the colors of specific leaves and even a couple different fruits! I hope you take the time to make one for yourself. UPDATE: Recently I completed a watercolor chart for greens - Here ya go. COPYRIGHT ©2018-2019Constance Reeder. All images and content are property of Constance Reeder and cannot be used without prior written consent.